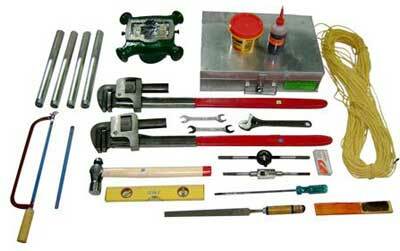 We are earnestly engaged in offering the complete range of Hand Pump Tool Kits in the industry. Our Water Hand Pump Tool Kits includes button die, thread tap, pipe thread, pipe wrench, jaw spanner, lubricating oil, multipurpose grease in packed container, Nylon rope, and so on. These hand pump kits are especially designed for the repairing and maintenance of all kinds hand pumps. Apart from that, we are recognized as one of the Deepwell Hand Pump Tools Suppliers in India. Button die in high speed steel with die holder,M12 x 1.75- 1 no. Pipe thread die with die stock 32mm- 1 no. Pipe wrench 600mm as per IS:4003/Part I (1978)-2 nos. Double ended open jaw spanner 16x18mm in CV steel- 2 nos. Screw driver 250mm x 8mm dia-1 no. Ball pein hammer with handle (1kg approx. )-1 no. Hack saw frame with six spare blades 300mm- 1 no. Flat file with handle, rough, 250mm â�� 1 no. Wire brush, fine wire â�� 1 no.